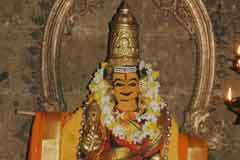 10 day Brahmmotsavam in Chithirai and the Agasthya wedding festival on the first day of the same month (April-May) and Thaipoosam in January-February are the festivals celebrated in the temple. 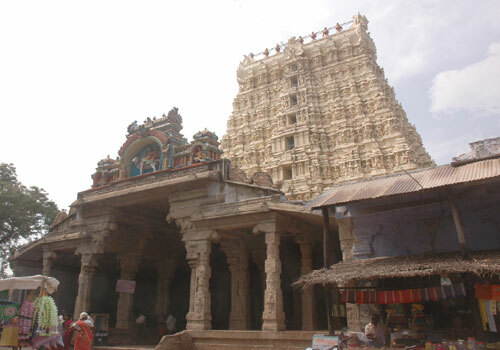 The temple is open from 6.30 a.m. to 1.00 p.m. and 6.30 p.m. to 8.00 p.m.
Sri Papanasanathar temple, Papanasam, Tirunelveli district. +91- 4634 - 223 268. 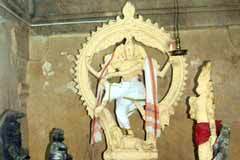 Lord Nataraja graces from a separate shrine adjacent to the main tower – Rajagopuram – in the Ananda Thandava form (graceful dancing). He is praised as ‘Punugu Sabapathy’. The turmeric water used for the abishek of Mother Ulagammai is consumed by women in small quantity for a happy wedding and child boon. Women also believe that this would increase the longevity of their Mangal Sutra. 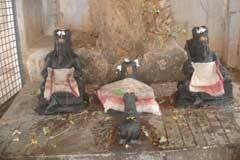 Devotees perform abishek to Lord Shiva and Mother Ulagammai and offer vastras. 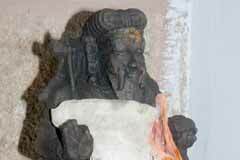 Indira, the king of the Devas had Dwashta, son of Sukracharya (Venus planet- the Guru of the demons)) as his Guru. Indira came to know that Dwashta was performing a Yagna for the demons and killed him and thus incurred the sin called Brahmmahati dosha. In order to cleanse himself of the sin, Indira wandered among the various Shiva Kshetras worshipping the Lord for relief from the dosha. 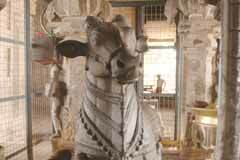 Guru, planet Jupiter advised him to go this place and worship Lord Shiva. Even as Indira was entering the borders of this place, he got relieved from his sin. 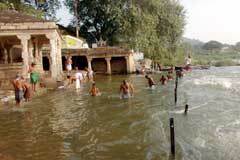 Hence, the place came to be known as Papanasam – meaning destroying sins and the Lord as Papanasanathar. Land of Sun: Sage Romasa sought the advice of his Guru Agasthya to choose places on the banks of Tambiraparani for installing Shivalingas. The teacher told the disciple to throw flowers used for Shiva Puja on the river, and do the installations where the flowers reached the shores. Romasa threw lotus flowers as advised on the river, nine of which reached the bank at various places and Papanasam was the first. Planets are nine, therefore, they were named Nava (nine) Kailash each attributed to one planet. Sun being the first in the planets, Papanasam is attached to Sun known as Surya Kailash. Mukkila Lingam: Lord Papanasa Natha graces as Rudraksha in the sanctum sanctorum and also under the Mukkila tree in the corridor-prakara. It is said that three Vedas – Rig, Yajur and Sama – were the Kila trees offering shadow to the Lord and Atharvana Veda was the space. They worshipped the Lord in these forms. 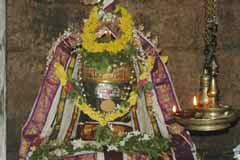 Hence, the Lord is named Mukkila Lingam. Also, the River Tambiraparani, springing from Pothigai Hills and flowing through the hilly regions reach the plains only at Papanasam. During the Uchikala Puaja (pujas during the afternoon), foods (nivedhana) are offered to the fishes in Tambiraparani. It is here that Lord Shiva granted darshan to sages Vyakrapatha and Patanjali standing between the horns of Nandhi on a Thaipoosam day. Recalling this event, special pujas are performed to Nandhi each year on this day with sandal paste. There is a pounding stone (Ural in Tamil) in front of the shrine of Mother Ulgammai. Women use to pound turmeric and make the turmeric water for abishek to the Mother. They consume a little of this abishek water hoping they will be married soon and blessed with a child. Married women believe that this abishek water consumption would also increase the longevity of their Mangal Sutras. Due to the heavy crowd of sages at Mount Kailash attending the wedding of Lord Shiva with Mother Parvathy, Earth lost its balance. Lord Shiva called Sage Agasthya to go to Pothigai Hills in the South and to balance the Earth level as his single weight was enough for the purpose equaling the weight of the millions of Rishis at Mount Kailash then. On the first day of Chithirai month (falling almost on April 14 each year), Lord granted the Wedding Darshan to Sage Agasthya. 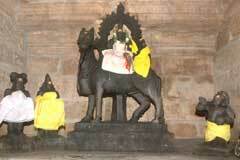 Lord Papanasanatha graces the Wedding Darshan behind the sanctum sanctorum as Kalyanasundarar on His bull vehicle. 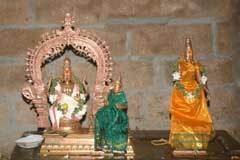 Sage Agasthya and his wife Lopamudra are in the shrine worshipping the Lord. Papanasam is 50 km from Tirunelveli with convenient bus facilities.